In this most recent body of work I have set out to interpret the balanced but beautifully random patterns and colours of the floral still life. Through an evolving, graphically-based visual language I endeavour to convey the energy and wonder that strikes me when observing the botanical world. This practice has also led me to examine why we are collectively drawn to cultivate and share flora as a means to express love, comfort and support. These floral impressions carry stories and messages that lend significance to events in our daily lives. They speak volumes when words fail to express our thoughts and emotions. The still life is not static – as in all life, it is dynamic, adaptive and fleeting. 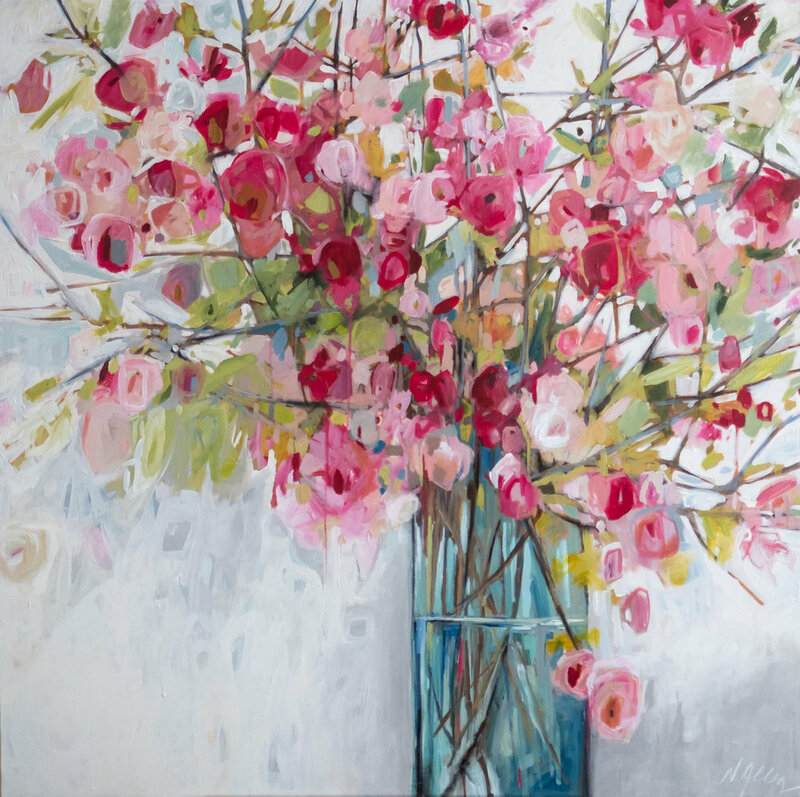 Born in Oakville, Ontario, Nicole developed an early appreciation for painting the Canadian landscape from her father. Nicole has an undergraduate degree in Art History from Queen’s University, and an honours diploma in Applied Museum Studies from Algonquin College. After working in the Art Rental and Sales industry in Victoria, B.C., Nicole and her husband Jeff settled in Ottawa in 1997 and have two wonderful teenaged kids. Over the years, Nicole has consistently developed her painting and figurative skills through her studies at the Ottawa School of Art and local artists groups. Vibrations, acrylic on canvas, 40" x 40"